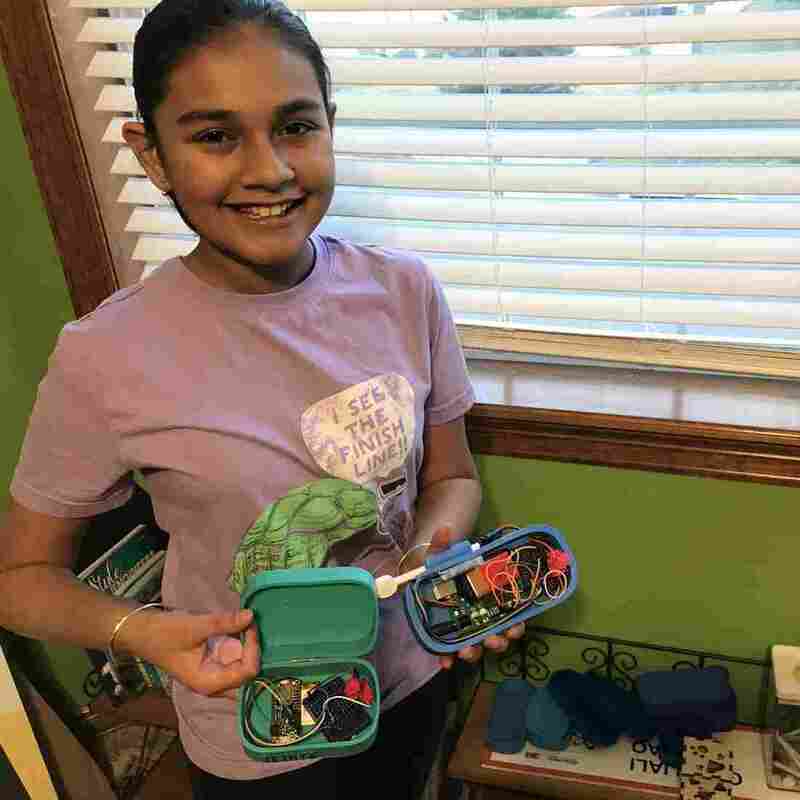 A 13-Year-Old Science Entrepreneur Wants To Bring Her Water Testing Device To Market A young teenager in Colorado has been named one of Forbes 30 under 30, a list made up of the "brashest entrepreneurs" in the U.S. and Canada. 13-year-old Gitanjali Rao with her lead detection device named Tethys. Rao was named America's top young scientist in 2017 and one of Forbes' 30 under 30 in 2019. Gitanjali Rao is already on the 2019 Forbes 30 Under 30 list and she hasn't even made it to high school yet. In 2017, the then 11-year-old from Lone Tree, Colo. was named 'America's Top Young Scientist' for the design of a small, mobile device that tests for lead in drinking water. Rao hasn't stopped there. She's now getting help from scientists in the water industry to create a working prototype of the device that could eventually be on the market. Rao's invention is named Tethys, after the Greek Titan goddess of clean water. The 3D-printed box is about the size of a deck of cards and contains a battery, bluetooth and carbon nanotubes. Rao got the idea after reading about how similar technology can detect hazardous gas in the air. Her immediate reaction was "why not use carbon nanotube sensors to detect lead in water?" The Flint water crisis was the motivation behind the invention. Rao remembers watching her parents try to test their drinking water with an at-home test strip kit. The results seemed inconclusive and unreliable. The other option was to send a water sample to a lab. "[Tethys] is for people who don't really know what's in their water from the pipes leading to their house. My target market right now is people in their homes as well as schools," Rao said. Here's how it works: Carbon atoms link together in a beehive shape and connect to create a tube — a nanotube. The carbon nanotubes respond to changes in the electron flow. If there is lead in the water, the lead sticks to the carbon ions, creating resistance. Tethys measures that resistance, and sends the data to a smartphone app to give the status of lead in water. Selene Hernandez-Ruiz, a lab manager at Denver Water, has partnered with Rao to test and improve her device. The two started working together after Rao was invited to take a tour of Denver Water's facilities. Rao is working with Dr. Selena Hernandez-Ruiz, a lab manager at Denver Water, to create a prototype of her lead detection device. Hernandez-Ruiz told Rao she could come back if she wanted to use the lab. The 13-year-old was hooked, "I asked, can I come here, like, everyday?" Hernandez-Ruiz and Rao get together about once a month to work on the device and test its results. "Right now, I'm looking at interference with other chemicals in water apart from lead," Rao said. "Like, what if [the carbon] accidentally binds to fluoride? So that's kind of what I'm trying to tackle." 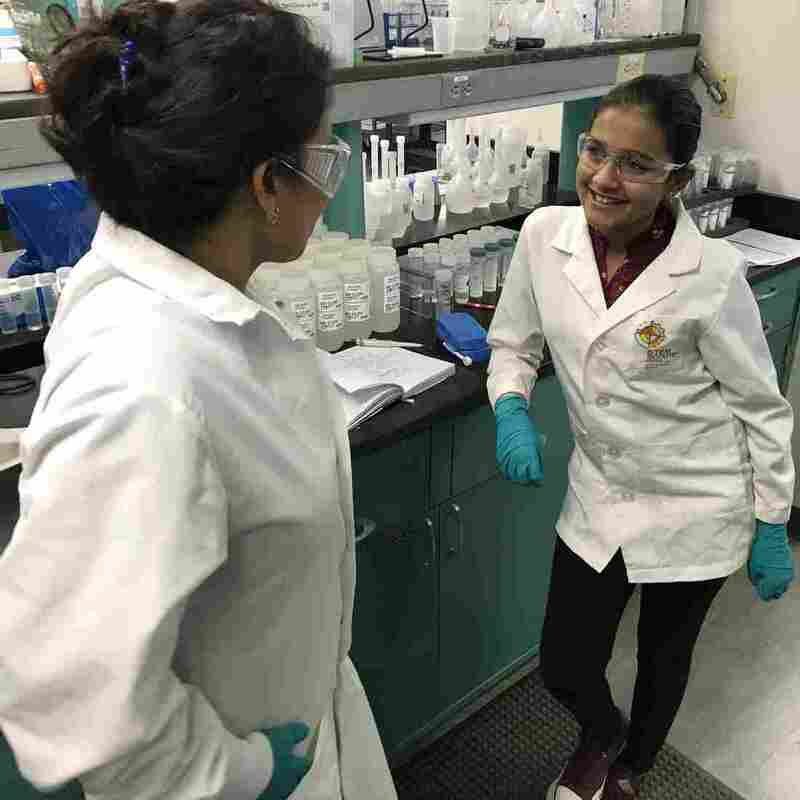 Hernandez-Ruiz is thrilled to help a young woman of color foster a passion for science. "It's so hopeful to see the current and next generation going for it," she said. "With really the desire to excel and test those boundaries that sometimes we're told we're not supposed to come close to." Rao is thankful for the opportunity Denver Water has given her to continue to work on her device. "My mom won't let me use lead in our backyard," Rao said with a laugh. "This gives me the potential to take [Tethys] out there. I know my device can be accurate." Rao hopes to get a prototype out into the world in the next two years. In the meantime, she's filling up her inventor's notebook with new ideas.